The typical roof is comprised of multiple components working in harmony to protect and cover your structure. The failure of one roofing element often leads to the failure of others. The best way to prevent roof failure and expensive repairs is through Artisan’s Maintenance Program -periodic and consistent inspection of your roof’s vital components. Failure of the roof components allows water into the interior framing of home that can cause issues in the walls, carpet and hardwood floors – all resulting in higher cost to the home owner by having the interior damage issues resolved in addition to the roof repair. A roof inspection should be scheduled every two years after the ninth year of the original roof installation to catch issues before they are seen in the home. This action can prevent unwanted interior damage. These inspections check all attached components on the roof surface that can fail due to excessive heat, cold, ice, snow, rust, and high winds. In addition to inspections, Artisan can provide Roof Certifications for insurance and other purposes. If your roof is approaching ten-years old, call us today to schedule your maintenance inspection. 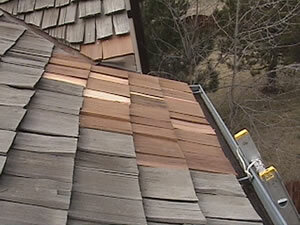 Preventing costly interior damage and extending the life of your roofing system is our primary goal.